Scroll down to see trip reports on any of the areas highlighted on the map. Click here for the “live” Google map – you can zoom in and out for more detail. 1. Montreal River/ Smoothwater Lake/ Scarecrow Lake/ Sturgeon River/ Wawiagama/ Obabika Lake/ Diamond Lake/ Tupper Lake etc. Love your blog! I’m planning a 30 day trip and it’s been so helpful reading your posts and hearing about your adventures! 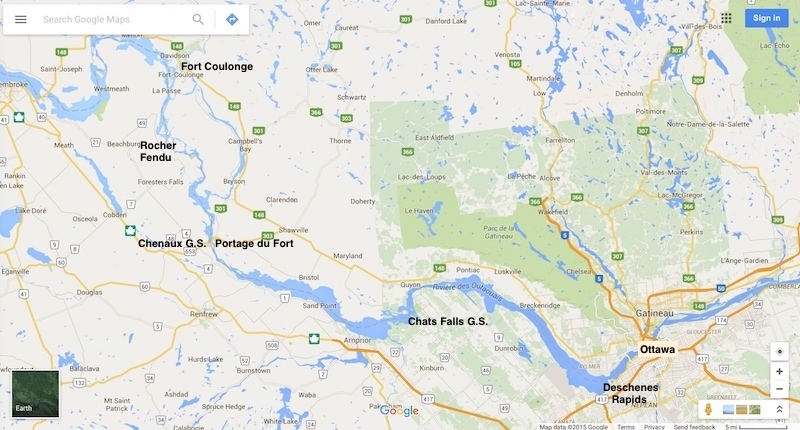 Right now I’m planning on either the Albany or Flindt River both would end on Lake Nipigon. I’m curious about your thoughts on both the rivers, and which you have enjoyed more. Or if there are other rivers in the area just as good! Girlonthetrail – if you are looking for nice views, this trip should provide you with some! Thirty days – what an epic circular paddle that would be! We spent 17 days to do our version of what you’re thinking of. You plan on doing this solo or with someone in the bow? Where are you coming from – southern Ontario? Manitoba? Is there room in your budget for a bush plane pick-up or drop-off? So many options with a thirty day window to play with though a solo trip would slow you down somewhat – always having gone tripping with my bro I have no real idea of how that would impact! If you wanted the Albany to be a part of the trip, you’d access the Albany at Osnaburgh Lake off Highway 599 and then paddle down to Petawanga Lake or even further to the mouth of the Attwood River. We only spent four days on the Albany from the mouth of the Misehkow to Petawanga Lake and had four portages – all around major rapids/falls- to deal with. Just above the Misehkow/Albany junction is a long stretch of whitewater with some challenges. Doing the Albany would expose you to a more majestic river with some very scenic spots. 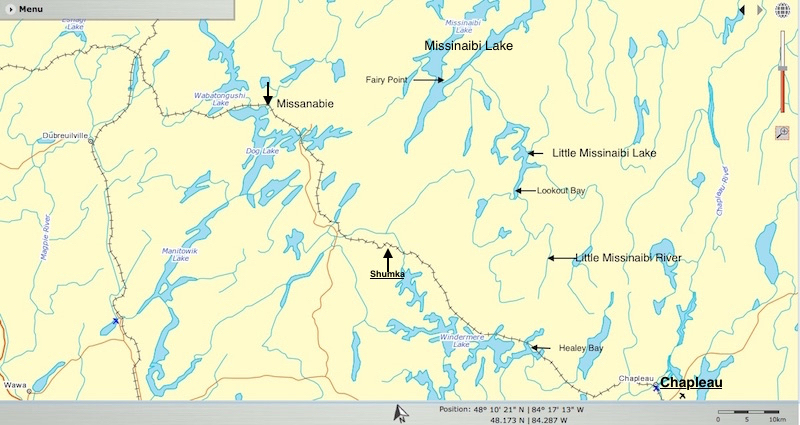 Ken Kokanie and his canoe pal did the route from Osnaburgh Lake to Miminiska Lake and posted a useful 1 50000 map set. My Albany River post has a link to his site. Your biggest decision would be where to leave the Albany and start heading south. 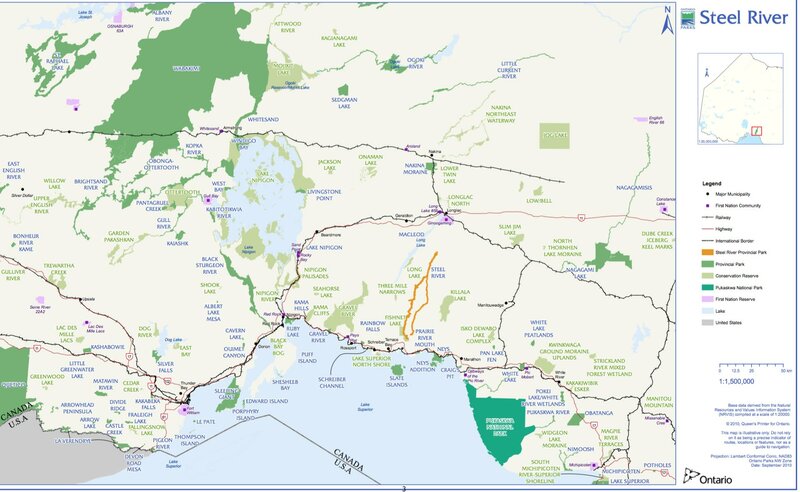 Once on Petawanga you could redo our path south to Lake Nipigon via Petawa Creek and the Witchwood, Raymond, and Pikitigushi River systems. Or you could keep on going down the Albany to the mouth of the Attwood River system and paddle it all the way back up to Hurst Lake before turning south to the Witchwood River system towards Whiteclay Lake and the Raymond River system. We went for the shorter option but it did mean a hard day on Petawa Creek! You could avoid the top bit of the Albany by doing what we did. We came down to the Albany from the Misehkow after flying in to Rockliff Lake near its headwaters from Mattice Lake near Armstrong Station. It was a nice four-day paddle with a couple of 800 meter portages. On thing for sure – you are not going to be seeing a lot of other paddlers! Make sure you have a SPOT Connect or a sat phone and maybe talk with the people at Mattice Lake Outfitters beforehand about emergency bush plane extraction if you run into something unmanageable. They might also be able to arrange a food drop off of half your food load somewhere near the half way point of the trip – unless it is no big deal to take it all with you on Day 1. My bro and I had 75 pounds of food for eighteen days – two pounds per person per day. Something to keep in mind – most of the portaging comes in the second half of the trip and by that time half your food will be gone! I have read your posts about Wabakimi and appreciate the excellent quality and detail that you provide. A friend and I have been planning a trip to Cliff Lake for the first week of June and we need some help. Can you recommend any maps for the area that will work with Garmin? Right now I have just printed your maps off of your blog. 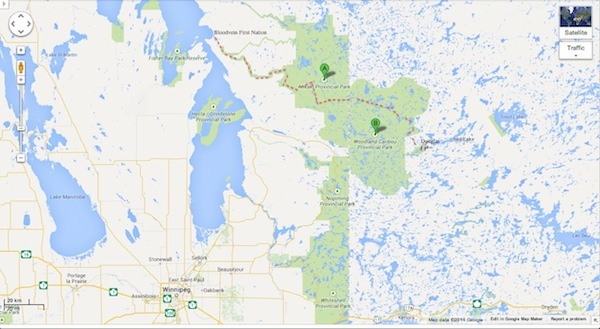 The Wabakimi Project is working on paper maps that might be ready before we leave on May 26. Thank you. Mike, you lucky guys! Cliff Lake is on our list of places we have to get back to! Re: the Garmin mapset. I ended up buying the Garmin Topo Canada version 4.0 set for my Oregon 450 because I knew it would work seamlessly with the Garmin Basecamp app on my iMac. You can also just buy parts of the entire map set for slightly less than the CDN $115. it sells for. People have been known to download illegal copies on the net and they often work okay. http://www.jeffstopos.com for a more user-friendly and visual approach. The Wabakimi Project maps are a smaller scale so we find the 1:50000 more useful for actual navigation. The Project maps are great for portage, rapids, and campsite locations. The Wabakimi Project crews were in the area in 2014 and worked on some of the portages that we found in pretty rough shape – like the one from Derraugh Lake into Pikitigushi Lake. You don’t mention how you’re getting there and what your route is. I may be able to help you out with more details or maps. Just send me an email with the details of your route and I’ll see what I have. We are entering at Caribou with a tow to Linklater and then down the Big R. To Gort. That is an area cleared and marked bt Wab. Pjt. last year. They may have that ready for us by the time we leave which will help…but it may not be ready. We’ve stared at that area ourselves! Congrats for taking it on – looks to be a bit of work but early season water levels should help. It will make for a great trip report! Needless to say, any useful maps of your route will have to wait until you post yours! Re: your tow – are you getting towed all the way down Caribou lake to Kellar Bay and then do you portage into Linklater? After you paddle up to Cliff Lake from Gort Lake are you coming back the same way? Tow into Kellar Bay and dropped at the port. Coming out via Pickitagushi and Boucher’s bear camp. I am a bit apprehensive about the Big R because I saw a report that it is a real bugger in low water. I am counting on spring water levels to facilitate passage. We will have 8 days from entry to exit. Did you look for a potential campsite on Gort? Now I get it! You save 30 kilometres of paddling by getting towed from the end of the Caribou Lake road all the way up to Kellar Bay. If you wanted to paddle, there is Little Caribou Lake – long and narrow and more like a river – that goes up quite a ways and then there is the shelter of a series of islands as you make your way into Kellar Bay. But a tow is always plush and also way cheaper than a bush plane insertion! Re: campsites on Gort. There is apparently one on the east side of the river going up into Ratte Lake from Gort Lake. On your return further down there is supposedly one at the end of the portage going into Derraugh Lake from Wash Lake. We ran the easy C1 rapids (YMMV!) and did not see the site. You can camp on the Bad Medicine portage – on the flat part on top – if need be although you will almost be at Cliff Lake by then so finishing the job might be best! After the trip is all done you will definitely remember doing the Bad Medicine portage! It will be worse going up to Cliff Lake. You should be good with eight days. It will allow you at least a couple on Cliff Lake. You could sample different campsites! The maps in my post should be all you need for the Cliff Lake to the Boucher Bear Camp stretch of the Pikitigushi. Can’t help you with the Big River section. The fact that a Wabakimi Project crew went through recently and groomed the portage trails should make it less daunting. I hope Phil or Barry can send you at least copies of the particular pages that apply to your route in the next little while. Enjoy your time with the pictographs! Thinking of doing the missinabi, bloodvein, or wabakimi trip. Can you let me know how the bugs and portages are for these trips? Thanks in advance. Johnny, I just got back from a three week trip down the Coulonge River system to Ottawa – so I missed your question by a couple of days! Bugs is a difficult one to predict. For example, we did not use deet once on our trip this summer. For the past three or four years we have been giving our clothes a permethrin treatment – the lack of bugs may be due to that. We did not find the Bloodvein or Wabakimi to be especially buggy on trips we did in July or August or early September. We think that there is a sweet spot in mid-August when they tend to be least around. Bloodvein, once on Artery Lake and then on down to Lake Winnipeg is not a big deal. Lots of shelf rapids with easy portagr trails around them, all indicated with flagging tape the summer of 2014 when we went down. Wabakimi is a bit wilder and less travelled but Phil Cotton’s Wabakimi Project crew has done an incredible job mapping and actually establishing the portage trails. All you need is the map set for the area you’ll be in. It has been at least twenty years since we did the entire Missinaibi and we haven’t been on the upper stretch down to Mattice in 15 years but the portage trails are well-established and the Hap Wilson guide book is an invaluable source of info on the challenges you will face. Also lots of trip reports out there to give you more recent observations. Really, you can’t go wrong with any of your trip choices! I hope you had a good time. Let me know how it went! 1st off. Love your site. I, like yourself, enjoy researching trip details. I thought I was pretty good at it. Then I read some of your trips and realized there was a next level. you appear to be approaching Jedi status. Just great. Anyway, I paddled pei south of Killarney this aug. your blog certainly helped on that one. A short w/e trip to north tea lake in Algonquin, and a 5 nighter in pukaskwa on the coastal trail. Planning on wakakami next fall (I don’t start tripping til middle of aug earliest). Thinking Allenwater to little caribou. U did it in 10 days I believe, so I’m hoping, even solo, to do in 10 as well. Then since I’m up there anyway, perhaps 3-4 nights in quetico as it’s a 20 hr + drive for me. But, after the wabakami trip, will prolly find a spot south of emerald island, set up a base camp, and just day trip. Brian, you picked some nice spots to paddle this summer! 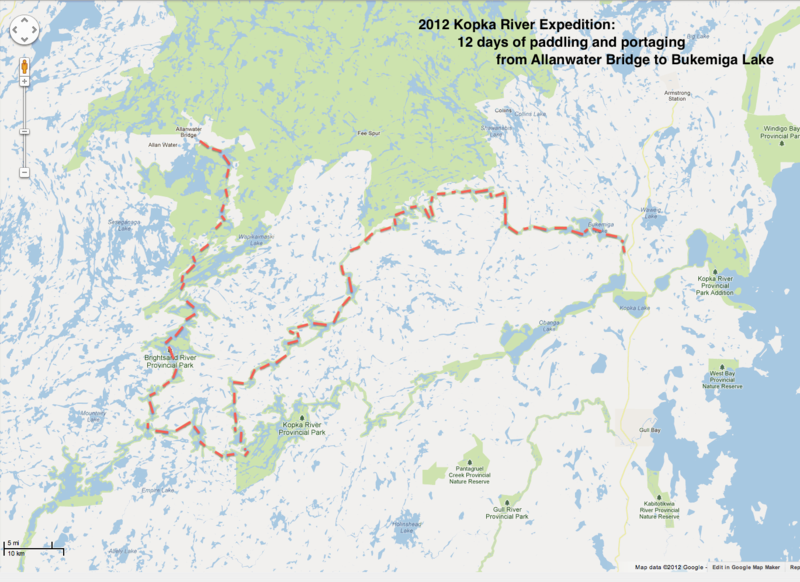 Was Pukaskwa a hike or a kayak trip? Wabakimi would certainly make for a great destination. The trip you’re wondering about was our first visit in 2010; we returned three more summers after that! Re: canoe or kayak? My bro and I agree that canoe is the way to go. I’ll admit that neither of us have any experience portaging a kayak solo but there are enough portages – even if none are really long – that we can’t imagine it would be much fun. Better to go with a craft designed for exactly the terrain you’ll be travelling through. BTW – the Allanwater post is one of the first I ever wrote! I reread it this morning and thought – “What a disorganized mess!” Nice to hear you found it useful. I laughed out loud when I saw that comment about approaching Jedi status! You are right about the obsessive level of detail. I’ve taken 35 years of preparing material for my high school students and applied it to our vcanoe trips! My wife has been known to roll her eyes as I tell her there is just a bit more to explain before a post is done! Best of luck with your plans. We may well return next summer too! I’ve been thinking something along the lines of this for portaging the kayak. Haha. I should prolly test it out on something easier than a 10 day trip north of thunder Bay I suppose. but I still may lean towards my canoe. I have a bit to figure it out. I do like the kayaks, especially solo, on rougher water. And I hiked in and out (not entire trail). 6 days, 5 nights. Pretty nice scenery for sure. Weather changed about 3 times a day. A tough trail for sure. McLean’s magazine had it @ 4 for for the toughest trails in Canada (mind you, it was by votes). But it was definitely rugged. But. Being on the southern tip of the boreal forest, and, having never Camped that far north before, it definitely made me want to go back (hence, wabakami). I do have another question though. Even though I think I know the answer. Why no Algonquin or killarney? My guess was that you guys prefer true wilderness. And the # of people prolly is an additional reason I’m guessing. But. Those are just guesses. O. I do love the shortcut idea if I’m lagging behind schedule. That’s actually pretty huge. And I don’t fish. And again, thanks for your help. I’ve seen that kayak yoke before – looks like fun! Some models provide better visibility but at the price of having the kayak up too high off your shoulders. Whle kayaks do have their plus points, portaging will never be one of them, especially if you are doing the carry on your own. 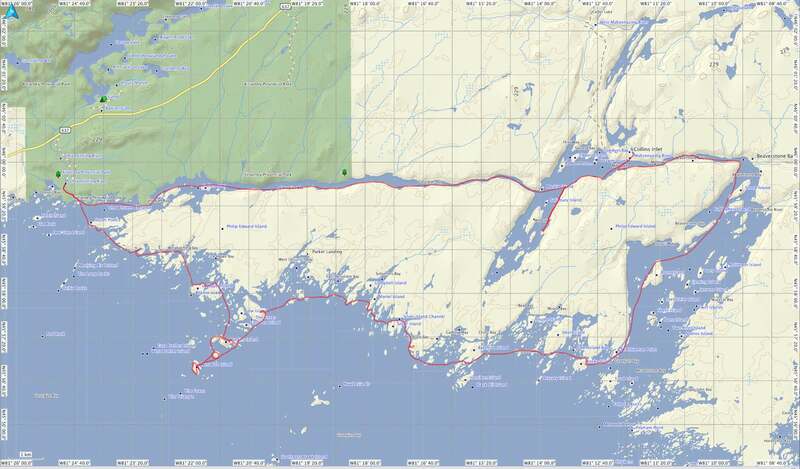 In the mid-90’s I did the Pukaslwa coast in a kayak from Hattie Cove to Michipicoten. Awesome trip, incredible scenery…am thinking we may go back and do it in a canoe – but with a spray skirt! Bravo for walking that trail! Next up – the West Coast Trail on Van Island! haha – you’re right about Killarney and Algonquin. Way too many people and prebooking campsites is just not our style! I was last in Algonquin in the mid-1980’s and Killarney in the fall of ’96. Both are okay if you do them off-season like the week we just spent in the French River delta. 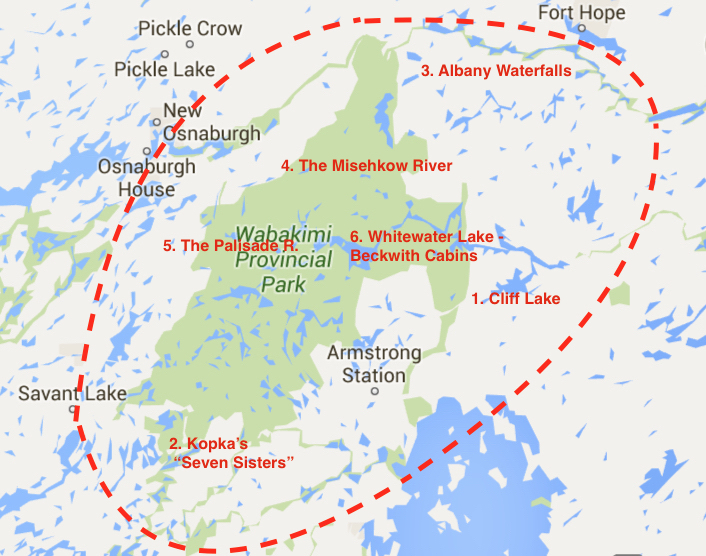 Wabakimi gets maybe 1/100th the visitors that those southern Ontario parks do! You’ll have lots of time to mull things over before it comes time to strap that canoe – or kayak! – to your car top. Good luck! It is – but a higher center of gravity isn’t! Thanks for all your help. Will probably be asking more next summer as September draws closer. Another fact is, my canoe isn’t the lightest. I’d have to weigh them to be sure, but it’s pretty close, and possible the canoe (Ya it’s on my list of very near(ish) future purchases) weighs more. Hello, I just came across your blog and have briefly looked at many of the epic adventures you have had. What a great journey for a young person, although a bit too adventurous for someone like myself who is a senior. This best I can do is keep to the roads to see the Ontario. As a “Fire Buff” and someone who is interested in Ontario fire service histories, I was reading your review of your trip to Missanabie. It was interesting to see that a train still operates through the area. We recently stopped into Hawk Junction and the train services has been suspended and the train station abandoned. Although there wasn’t a lot about the fire department in Missanabie, I did see a few pictures, one of the fire hall and another of a fire truck near some construction trucks. I had tried contacting Ernie a few years ago, but he apparently didn’t want to communicate or share information about the fire service. Since I will probably never make it to Missanabie and with you taking a picture of the fire hall, I am hoping you will give me permission to place it in within my collection. PS: As already mentioned I have taken a look at some of your blogs, and as a retired safety professional I really appreciated seeing your willingness to share your experience, and offer safety tips to keep others safe. Rob, nice to hear that some of our photos of Missanabie caught your eye! We all have our little niches that keep us busy. Ours is pictographs and yours is fire halls! Feel free to use whatever images you want on your website. 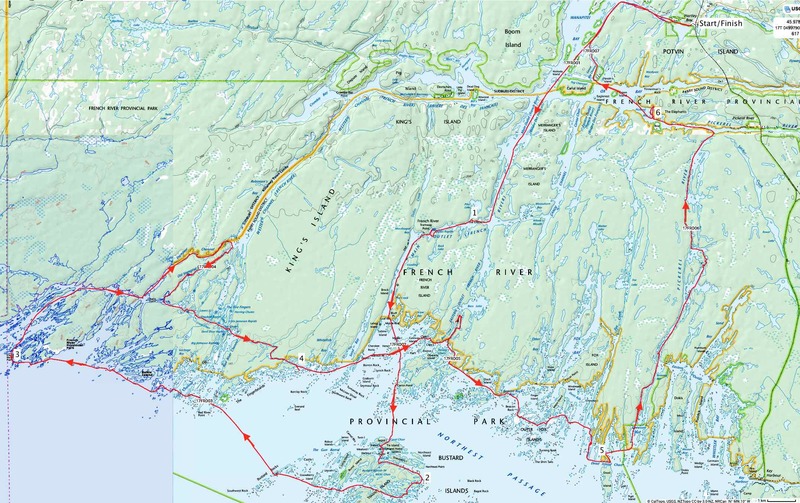 That train we took from Missanabie back to Healey Bay might make for a nice little three or four-day adventure for you. 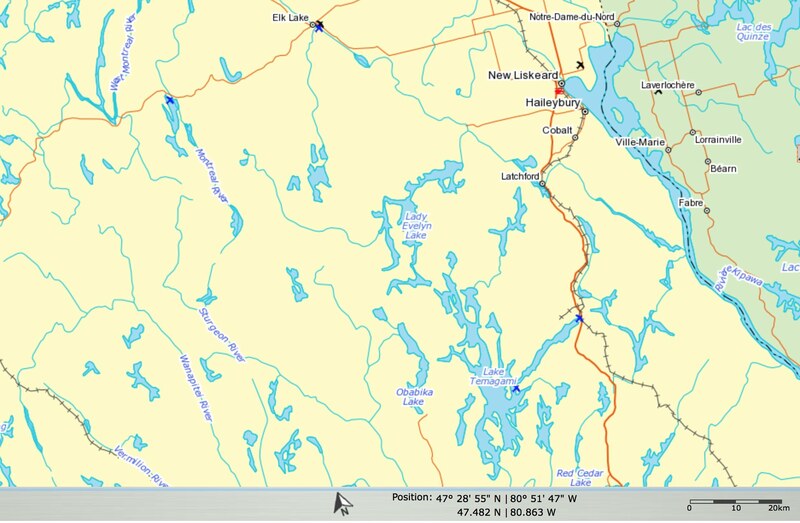 It goes from Sudbury to White River and stops at a few places like Chapleau and (if you want, Missanabie) along the way. You could hop on and off and get some neat fire hall photos at both ends and in some in-between spots too! In two days you could do a return trip! BTW I had to chuckle when I read the line – “What a great journey for a young person, although a bit too adventurous for someone like myself who is a senior.” The fact is – I was 66 when I did that trip last year and my young bro was 63! We think we can keep going into our 70’s. I keep repeating the line “Seventy is the new fifty”! Keep having fun doing your fire hall research – it is worth preserving the history and images. Good day. I’m heading up the James Bay road in northern Quebec. Plan to paddle out in james bay and camp in Nunavut (weather pending). Also just going to grab a lake or 2 and explore them as well. Have you done any investigating in this area by chance? Brian, sounds like an epic plan you have in mind! How far up that road from Mattagami are you going? There are a few rivers that you’ll be crossing that would take you down to James Bay. I am not familiar with any of them, having only come at James Bay from the Ontario side – down the Moose River a few times and once down the Attawapiskat. You could drive all the way to the coast at Chisasibi and put in there. I grew up in Noranda some 250 km south of Mattagami – the road did not exist in those days! It must have been built as a part of the Baie James Project in the 1970’s. Then it would be 1400 kilometers of paddling on James and Hudson Bay to reach Nunavut! I am not sure what you understand by Nunavut. Is it the territory north of 60º or is it the islands in James Bay? As for paddling the waters of James Bay and Hudson Bay, I am sure you have considered the complications. If not, do read through this thread at the Canadian Canoe Routes forum. It should convince you that your plan would best be scrapped. Grabbing a lake or two? Spend some time at the CCR site and see if any canoe trippers have done a trip in the past that looks like something you could do. Brian, nothing like a bit of detail to clarify things! I had no idea that Nunavut included those rocks and islands along the east shore of the Bay! If you have the map sheet i.d. you’ll find it. Fort George, for example, is on the Île Goat Map – 033E15. Enjoy your ride up and your paddle out – and back! Dave, we faced the same question in 2012. We had a 60-lb. 16′ fiberglass canoe and wanted something lighter. We often paddle on our own in areas which are far from help. We are also both in our 60’s and have our share of crazy river running stories from our 20’s and 30’s. These days we are a bit more deliberate and cautious! Those factors make the lack of expedition ruggedness of a lighter canoe like our Swift kevlar/carbon easier to justify. We went for the 42 lb. model with optional skid plates front and back and loved it. We did not baby it by any stretch. At the end of the second day of use – it was the Kopka trip – we flipped the canoe over and looked at the scratches. It hurt to look at them but it was just cosmetic – and it was proof that we were doing what we like to do. If we just stuck to paddling the lakes in Algonquin Park we wouldn’t get any scratches but we wouldn’t be where we wanted to be either. Fast forward to 2017. We paddled down a stretch of the Little Missinaibi that few if any paddlers have gone down in the past decade or two. Logjams, sweepers, beaver dams … we were a bit impatient and just hauled our loaded canoe over all obstacles. We ended up cracking the belly of the canoe. Our fault for treating it like a Royalex. Our excuse – it was just too awkward to unload the canoe in the middle of the river as we were making our way down. We dropped off the canoe at the Swift outlet on the way home and told them to do what needed to be done. Their solution – a new full-length belly. I will admit we were shocked when we weighed the refurbished canoe. We now have a 58-pound kevlar canoe but the crack is not an issue! If I were you, I’d get a lighter canoe. Given that your standard is a 72-lb. Royalex, maybe you don’t need to go to 42 lbs. Maybe 54 lbs. or so will already seem like featherweight! You’ll appreciate the lighter weight. If your Mad River Royalex is at one end of the weight line, then our new in 2012 Swift was at the other. As for the extra $ that a lighter canoe will cost you, the trick is to divide the extra $1000 to $2000. by the number of years you’ll be paddling it. Let’s say a conservative 10 years. So now you’re only looking at $100. a year for a (much) lighter canoe. In the past year, my brother and I have occasionally turned to the question of whether we should get another light(er) canoe. My biggest problem will be in explaining to my wife why there are now two canoes in our backyard!